This volume records the Proceedings of the International Simulation and Gaming Association's 19th International Conference which took place at Utrecht University in 1988. Seven sections are contained in the volume. 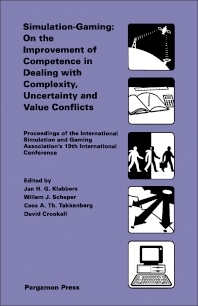 The first section on complexity, uncertainty and conflict deals with theoretical and methodological issues. This is the introduction to the conference theme "On the improvement of competence". The following sections cover broad areas: organizational change, business simulation, policy exercise, methodology, learning environments, and special topics such as environmental planning, health care, diplomatic games and gambling. For people involved in education and training who use, or are interested in using, simulations and games to improve competence in uncertain situations. (Section Headings and Selected Papers). Complexity, Uncertainty and Value Conflicts. On the improvement of competence, J. Klabbers. Global modelling in Japanese political science, H. Seki. Organizational Change. Organizational change, implementation, social simulation, cultural change and leadership, model switching, C. Takkenberg. Organizational change: workshop review, M. van Mens & A. Coote. Business Simulation. Business simulation: an introduction, W. Scheper. Wargaming, W.C. Borawitz. Policy Exercise. Policy exercise, (group) decision support, C. Takkenberg. Project definition gaming/simulation exercise, M. Polic & I. Wenzler. Methodology. Methodology: behavioral and social systems, design and evaluation of games/simulations, classifications, taxonomy, J. Klabbers. Problems of taxonomy for gaming in macro- and micro-economic subjects, R. Siebecke. Learning Environments and Communication. Learning environments and communication: an introduction, D. Crookall. Some dangers when using interactive events to improve competence, K. Jones. Special Topics. Special topics: an introduction, W. Scheper. Environmental Planning. Biosphere and underdevelopment, L. Schapira. Simulation of integrated rural development with IRDEM, F. Rijsberman & G. Baarse. Health Care. Improving dental planning through computer simulation, E.M. Bronkhorst et al. Diplomacy. Diplomatic games, P.W. Meerts. Gambling. Competence in gambling games, D. Saunders & D. Turner. Survival - a case study in risk taking, A.L. Cudworth.